Here comes a big power bank with 20 Ah capacity in the form of the ADATA P20000D Power Bank, their largest capacity model which caught our attention precisely with its big capacity, though we are going to be testing other ADATA power banks as well with smaller capacity soon. The ADATA P20000D is pretty big and weights almost half kilogram, but this is the result of the high capacity battery cells inside. The power bank is available in multiple colors and the one we have tested was the black version, though apart from the color difference they are using the same plastic case (being advertised as extremely fire, shock, and impact resistant). It is matte color mostly, though around the edges there is a glossy part that looks nice when the power bank is new, but easily and quickly scratches, so we are not that big fans of that design. Another thing that we do not like that much is the presence of a small LED light being advertised as a flashlight… that power banks simply does not need it as it is a sort of useless, but hey, another key sell point for 2 extra cents. What we find very useful and like is the display that shows the remaining capacity in percentage, it has a backlight as well and also displays the active input and outputs. 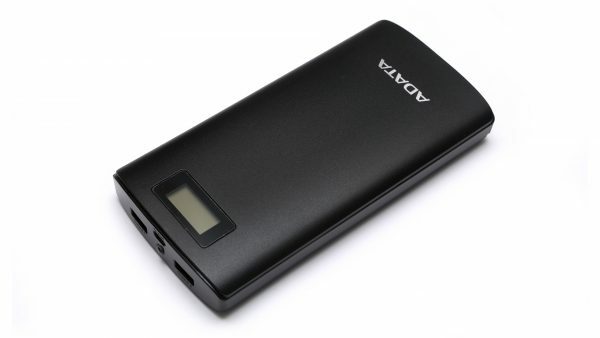 The 20000 mAh ADATA P20000D Power Bank comes with high capacity and that high capacity needs faster charging, though here we have a 5V/2A input that can easily take over 10 hours for a full charge of the batteries inside the device. There are dual USB outputs available, meaning you can charge two devices at the same time, though the combined output is 5V/2.1A, so not dual device fast charging, but two at 1 Amp each or one with thee higher charge current. Looking at the test results we are seeing good and stable voltage discharge curves – 4.94V at 1.0A and 4.8V at 2.1A, though we kind of expected a bit more in terms of actual usable capacity from this 20 Ah power bank… the results we’ve got are pretty much the average you could expect from a decent power bank. The high capacity is nice to have, but the bulky size and big weight certainly do not make that particular power bank from ADATA the best choice to always carry around with you in your bag or backpack.